A new website for BNH greatly improved search rankings, attracting thousands of relevant local visitors in the first year. BNH Associates are a Huddersfield-based legal services provider, supporting clients with witness statements, translations, locus reports, and a variety of other services essential to the outsourced legal sector. 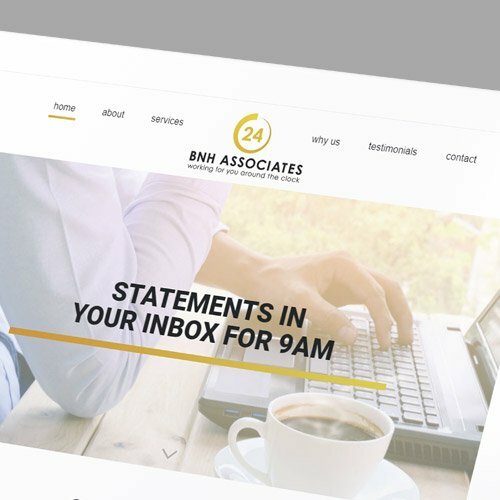 Their USP is their unique 24-hour offering, which means they can specialise in urgent matters and round-the-clock case management – they promise statements in your inbox by 9AM. Despite a unique offering for their industry, BNH were struggling to be seen on search engines – for whatever reason, they just weren’t being indexed properly, and needed someone to get to the bottom of their SEO woes. They also felt it was time for a rebrand after over a decade in the business, and wanted a new logo and website design to go with their improved search results. The first step was to get a handle on why the site wasn’t performing well enough on Google. As well as a handful of technical issues that became more of a problem as the site got older and Google changed how they ranked websites, the site’s structure and use of keywords was far from SEO best practices. We began with extensive keyword research, working out what people are searching for in relation to BNH’s industry and services, building a sitemap based on the results, with much clearer signposts to new service pages. This meant a better search performance for the site through keyword visibility, supported by an improved on-site user journey, making information about key services easier to access. 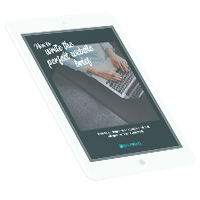 This is reflected in the website’s stats in the first few months after launch, with an initial bounce rate of 33% – two-thirds of the site’s visitors stayed to dig deeper than the page they landed on. In BNH’s industry, showing that you’re professional and reliable is more important than having the flashiest, most eye-catching brand, so we kept things simple for the redesign. The site’s design is quite minimal – very clean and clear, with bold and simple signposts to learn more about BNH and the services they provide. Imagery is subtle, so as not to overpower the headline statements and testimonials included in the copy. For the logo, we wanted to focus on BNH’s unique 24-hour offering, incorporating “around-the-clock” imagery into the branding, which could also be used across the site’s assets. 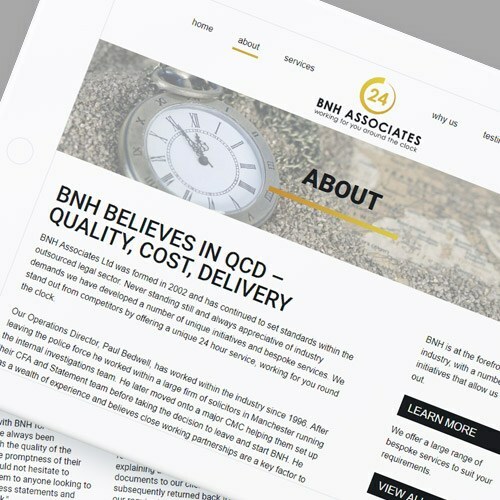 The site was built in WordPress, and is fully responsive on mobile – something that also assists with BNH’s search performance, as this is something that Google values. The content management system means it’s easy for the BNH team to update service pages or add new testimonials – they’re in complete control.